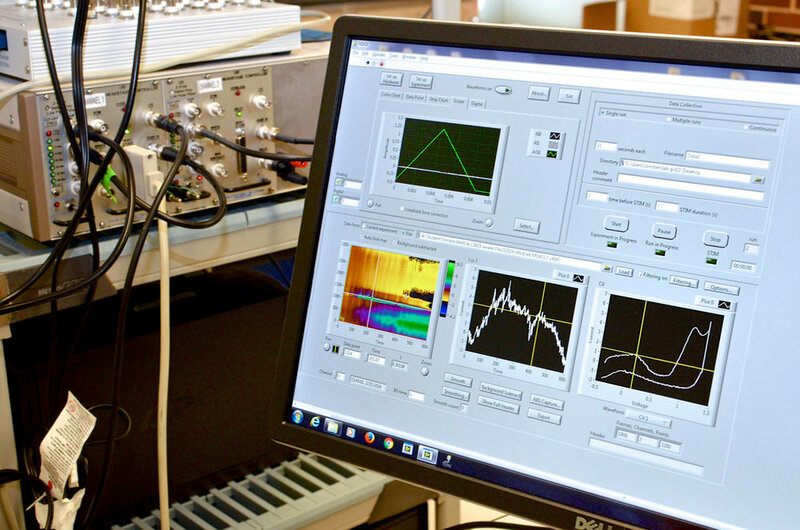 The Sombers Lab develops research instrumentation for ultra-sensitive measurements. The Sombers lab is located on the 4th floor of Cox Hall at NC State University. The lab space consists of ~1,100 sq. ft. specifically designed and equipped with desks, state of the art computers, a general purpose wet lab, an electronics design station, surgery facility, optical fiber and electrode preparation stations, and cell culture station to support our multidisciplinary research. Four systems for electrochemical measurements during behavior equipped with optogenetic hardware. Each of these systems is comprised of a custom operant conditioning chamber and a computer-amplifier interface consisting of a PC data acquisition card and BNC interface for A/D conversion and data acquisition. This setup enables precise control of specific neural circuits and electrochemical recordings with millisecond temporal resolution during behavioral assessment. Many of these systems allow simultaneous electrochemical recordings at up to four channels, and are coupled with microinfusion pumps for intracranial drug delivery. Four video tracking systems for real-time tracking of rodent behavior. Tissue slice voltammetry rig. An upright Nikon Eclipse FN1 microscope is equipped with multiple light sources and micromanipulators for imaging tissue and accurate probe placement. Within the chamber, a continuous supply of temperature-controlled physiological buffer maintains tissue viability. This rig includes multiple technologies to elicit physiological responses, which includes microinjection, iontophoresis, bi-phasic current, and photostimulation for optically excitable genetically engineered proteins (optogenetics). A multi-channeled electrochemical system is used to quantify chemical fluctuations in various tissue preparations. A cell rig for electrochemical recordings of individual exocytosis events at single cells in culture. This rig is equipped with an Olympus IMT-2 microscope with optics for Hoffman modulation contrast and fluorescence imaging, as well as an Axopatch 200B for ultra-low noise electrochemical recordings with microsecond temporal resolution. The cell rig is equipped for extracellular and intracellular voltammetric measurements of chemical transmitters. Two stereotaxic surgical stations with dissecting optics and virus delivery systemsfor precise control during surgery to implant electrodes and/or optical fibers. General use potentiostats/galvanostats. Two general use electrochemical systems are available - a bipotentiostat and a nano-potentiostat. Both systems are capable of performing a wide range of electroanalytical techniques. The bipotentiostat enables the potentials (or currents) of two electrodes to be independently controlled. It is designed to be used over a wide range of currents and potentials utilizing macro- or micro-electrodes. The nano-system is designed specifically for low current (pA and nA) measurements. Spectroelectrochemistry rig. A custom built microRAMAN system enables electrochemical measurements and optical spectroscopy to be performed simultaneously on micron-scale samples. A Nikon microscope was adapted to enable laser light to be focused as a tight spot onto a sample. 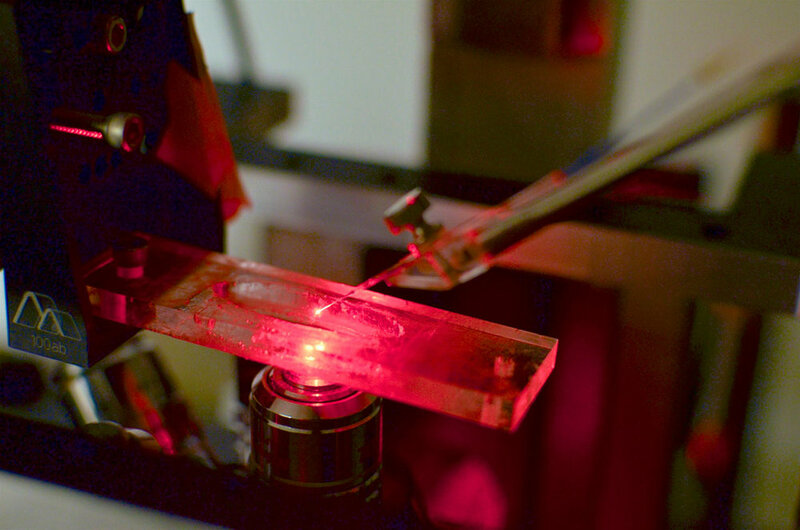 The light emitted from the sample surface is collected and dispersed by a spectrometer, and a liquid nitrogen-cooled CCD is used to quantify the intensity and wavelength of the light. A potentiostat is utilized to control the potential of the sample in order to drive the local electrochemistry. This system is typically used to evaluate changes in the surface of microelectrodes during the application of applied potentials. Flow injection electrochemical stations. These are used to evaluate electrode performance by introducing rapid changes in analyte concentration at the sensor’s surface, imitating the dynamics of neuronal communication. All novel electrode materials, geometries, and innovative detection and calibration schemes are developed at this station before they are employed as an implantable device. These systems consist of a multi-channeled electrochemical system, HPLC switching valve, fluid pump, and complete software control. These resources are complemented by a core Analytical Instrumentation Facility (NCSU), a departmental Machine and Electronics Shop (NCSU Chemistry), a departmental Biological Core Facility with an automated peptide synthesizer (NCSU Chemistry), the NCSU College of Veterinary Medicine Histology Laboratory, and the NCSU Mass Spectrometry Facility. The Mass Spectrometry Facility, located in the Department of Chemistry, houses state of the art liquid chromatographic (LC) and mass spectrometric (MS) instrumentation. LC options include high- and ultra-performance, as well as capillary liquid chromatography. MS ionization options include electrospray, MALDI, electron impact, and chemical ionization. 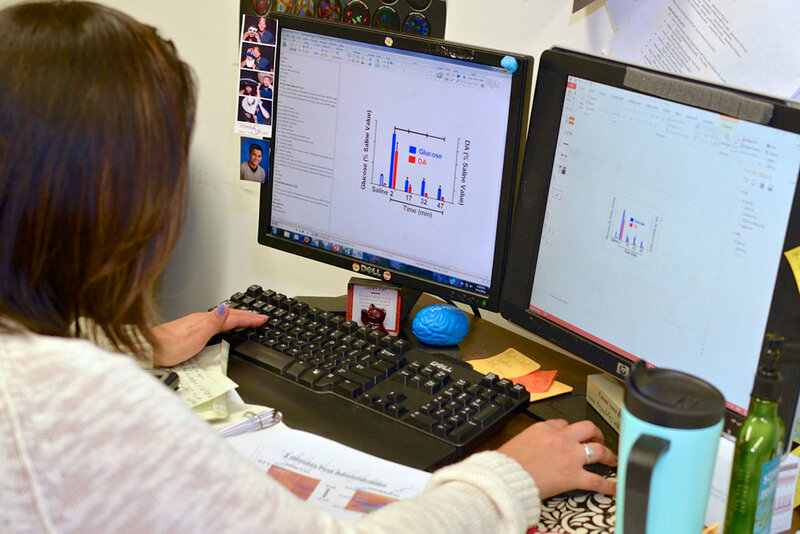 Mass analyzer options include orbitrap, linear ion trap, time-of-flight, and quadrupole technologies. Thus, we have access to a plethora of techniques appropriate for quantification of different classes of neurochemicals.